As we study through the Beatitudes, we need to keep in mind of the context of what we are studying. We are being taught why the believer is “blessed”. We are also being taught what makes us “blessed”. While we may be comforted to some degree when the death of someone we hold dear to us has passed away. This type of mourning is not what this verse is talking about. There is a question just begging to be asked, “What are we as believers, mourning that makes us blessed?” We are mourning or sorrowful for our sins. Here is what we are seeing in the teachings of the Beatitudes. All are poor and in need of a savior. When we accepted His grace-filled gift of salvation, our walk with Christ, as a servant of God (poor in spirit) makes us more sensitive to sin in our lives as we grow in Christ. Our human nature is naturally sinful and our walk in Christ is meant to grow more and more like Jesus every minute of the day, every day of the year and every year until we are face to face with our heavenly Father. 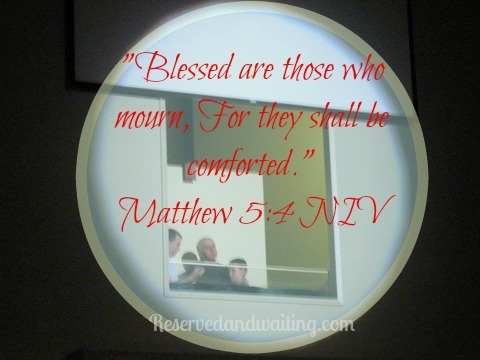 Therefore when we mourn, we are blessed. Our comfort here on earth is also our hope that one day we will eternally with God. Our comfort is knowing that God is faithful and just. He will forgive us of our sins and will never leave us or forsake us. How can we not be anything but blessed and comforted with these truths? Thank you sweet Father in heaven, for being my all in all, and for sending your son to save me from my sins and for comforting me with your Words. Thank you Father for being faithful and just to forgive me of my sins. How blissful I am for knowing and believing in You. Your promises fill my soul like none other. In Jesus sweet and precious name, Amen. That wraps up this weeks study on Matthew 5:3-4. If you missed part 1 of this weeks study, you can go to it here . This posted has been linked up with GROW in His Word. We will continue our study on The Beatitudes. It will also be broken up into two parts and we will be looking at Matthew 5: 5&6. Until then May God richly bless your walk in Him.